Toast the chilies in a dry frying pan, tear off the stems and shake out the seeds. Tear them into pieces and pit into a bowl with hot water to cover and soak for 30 minutes. Put the turkey (pavo o guajolote in Spanish) pieces into a large, heavy pan, cover with cold, salted water and simmer, covered for 1 hour. Drain, reserving the stock. Pat the turkey pieces dry with paper towels. Heat the oil in a large frying pan and saute the turkey pieces, a few at a time, until lightly browned on both sides. Transfer to a large flame proof casserole, reserving the oil. In a food processor combine the onions, garlic, half of the sesame seeds, the fresh coriander, the tortilla or toast, the tomatoes, the almonds, raisins, cloves, cinnamon, coriander seeds and peppercorns and chillies and process to a coarse puree. If necessary do this in batches. Heat oil remaining in the frying pan, adding 1 tablespoon if necessary and cook the puree, stirring, for 5 minutes. Add 2 cups of the reserved turkey broth, the chocolate broken into pieces, and salt if necessary. Cook, stirring, over very low heat until the chocolate has melted. The sauce should be quite thick. Pour the sauce over the turkey pieces in the casserole and cook over the lowest possible heat for 30 minutes. Just before serving sprinkle with the remaining sesame seeds. 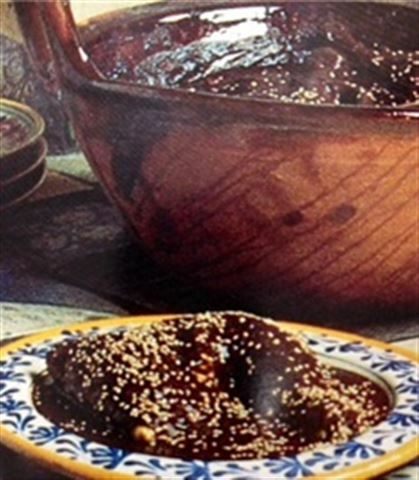 Serve with blind tamales or with hot tortillas, and guacamole. 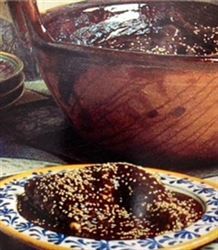 Enjoy this delicious mole poblano Mexican recipe! I made this mole. Very good, and not too difficult . I did make a couple of changes. I used almond butter instead of the slivered almonds, and didn't add the coriander sprigs and seeds. I overlooked them when shopping. The flavor is very similar the best mole I have ever had at a San Diego restaurant.